The Progress Report for the Yarra Strategic Plan provides an update of the work undertaken to date, next steps to deliver the community’s vision and for the first time, publicly available maps of the whole Yarra corridor showing key recreational sites and protected areas. The extensive stakeholder and community engagement undertaken on the project will inform the development of the draft Yarra Strategic Plan, which will be released for public comment in 2019. Once complete, the Yarra Strategic Plan will give effect to the Yarra River 50 Year Community Vision and provide a single, integrated river corridor plan that enables collaborative management of the river with Traditional Owners, and guides localised planning, to ensure the Yarra is managed as one living and integrated entity. In February 2017 Melbourne Water were nominated as the lead agency in the development of the Yarra Strategic Plan to enable the Yarra River to be managed and cared for as one living and integrated entity. A key requirement of the plan was the inclusion of a long-term community vision for the river. Beginning in September 2017, Melbourne Water gathered information about what the community values and how they want the river to be cared for in future. 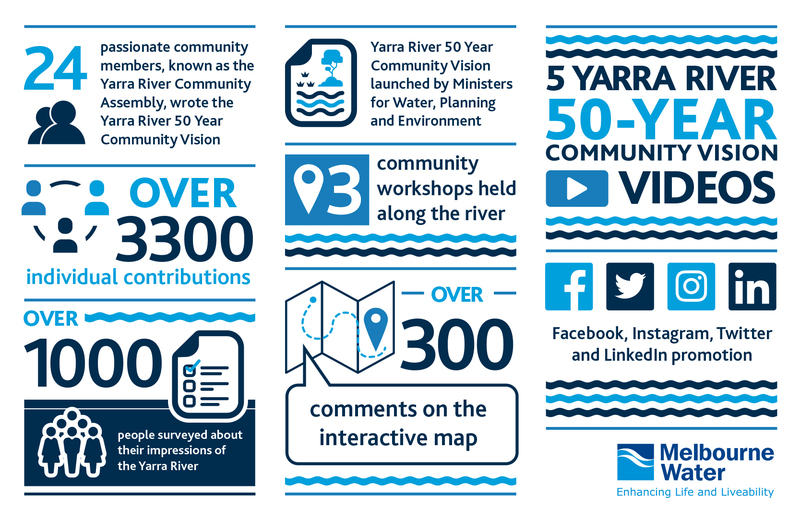 In February 2018 Melbourne Water brought together 24 randomly selected passionate citizens, known as the Yarra River Community Assembly, to write a 50-year community vision for the Yarra. Members of the assembly heard from experts, including Wurundjeri Elders and community, about the history of the Yarra and its cultural significance to the Traditional Owners. The group used the stories gathered from the broader community to write a vision for each of the Yarra’s four reaches (upper rural, lower rural, suburban and inner-city) and an overarching vision for the whole river. Between May and August 2018 Melbourne Water undertook community engagement to build the content of the draft Yarra Strategic Plan. This engagement included a series of community workshops, an online survey, an interactive online map and social media promotion. Summaries of the workshops and online engagement are now available in the Document Library. The information collected from the community will be used to write the draft Yarra Strategic Plan, to be released in 2019. Workshops are now complete.Thank you for attending and helping us to build a plan that will deliver the community’s vision for the Yarra. Consultation reports will be available online August/September 2018. Read the visions that will provide the building blocks for how the river and its land are used and managed in future, to ensure the Yarra remains a proud part of Victoria’s identity. Want to learn more about the Yarra? Melbourne Water has partnered with Victoria Walks to design a self-guided walk that highlights the historical, cultural, natural and social values of the Yarra, along with some of the challenges the river system faces. Find out more about the co-design process for the 10-year Healthy Waterways Strategy in the Yarra Catchment and how you can get involved.